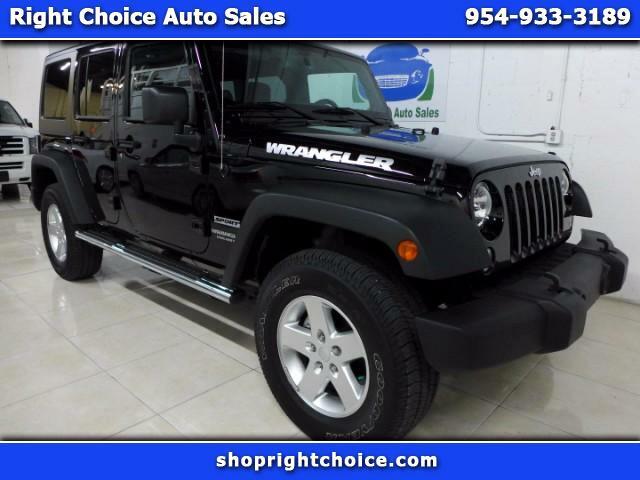 WE CAN DELIVER THIS LIKE-NEW JEEP TO ANY DRIVEWAY IN THE COUNTRY! VISIT OUR WEBSITE AT WWW.SHOPRIGHTCHOICE.COM TO SEE 81 PHOTOS, THE FREE CARFAX, AND MORE INFO ON THIS AWESOME DEAL! THIS 1-OWNER JEEP WRANGLER UNLIMITED 4X4 SPORT IS IN LIKE-NEW CONDITION AND WAS JUST SERVICED ON 10/30/17 AND HAD A MAINTENANCE INSPECTION AND AN OIL AND FILTER CHANGE SO IT'S READY TO ROLL! DON'T MISS THIS DEAL!